I’ll start with the Litany of Impressive Facts, for those of you who don’t follow men’s college basketball. 36 seasons at Carolina. 11 Final Four appearances. Two national championships. 96% graduation rate. Coaching Hall of Fame. Presidential Medal of Freedom. Basketball fans in general can thank Coach Smith for the 35-second clock, which was developed in response to his game-slowing Four Corners defense. But they can also thank Coach for that gesture players make after scoring, pointing to the player who passed them the ball to share the glory. Coach Smith started that tradition, along with starting all seniors (including non-scholarship walk-ons) at their last home game, and having the entire bench stand up when a starter comes out. That’s not basketball–that’s kindness, honor, decency. And fans of a certain kind of decency will appreciate that Coach Smith never, ever cursed, and did not allow his players to use foul language in his presence either. Other former UNC players–a galaxy of NBA stars, but non-scholarship players as well–are now chiming in with stories of how Coach Smith helped them negotiate the world as they left Carolina, how Coach remembered their mom’s name and asked about her, how Coach would call to check on them if they’d sustained an injury. The man cared. But here’s why I think anyone–not just basketball fans–should want to know about this man. Dean Smith never let his role as a highly-paid, political figure (don’t tell me Div. I basketball coaches aren’t political figures!) keep him from following his conscience. He participated in desegregating restaurants in the early 1960s. In 1966 he was the first coach to offer an African American player a scholarship at UNC, when white players and fans were still spitting on Black players. He protested, with his church, not only the Vietnam War and nuclear proliferation, but the death penalty. He even took his players to visit Death Row inmates in Raleigh. In later years, through his church, he supported gay rights. Remember: we are talking about a MEN’S BASKETBALL COACH. In the SOUTH. To me, his legacy is summed up in something that happened that I was involved in peripherally, years and years ago when I first learned about his involvement in desegregating the restaurants in Chapel Hill. And I asked him about it ’cause it was his minister who told me the story. And he said, I wish Reverend Seymour hadn’t told you that. And I said, Dean, why? Why would you want that? You should be proud of being involved in something like that. And he looked at me, and he said, John, you should never be proud of doing the right thing. You should just do the right thing. Now aren’t you glad you took the time to read about this man? Rest in Peace, Coach–and thank you. This entry was posted in Wing's Words and tagged Carolina, Carolina basketball, Dean Smith, death penalty, Final Four, John Feinstein, Michael Jordan, NCAA basketball, peace, racial equality, Tarheels, UNC by gretchenwing. Bookmark the permalink. Thanks, Gretchen. Once again, you’ve helped me look at a personal bias (this time about college sports and coaches) and look beneath the surface of my viewpoint. 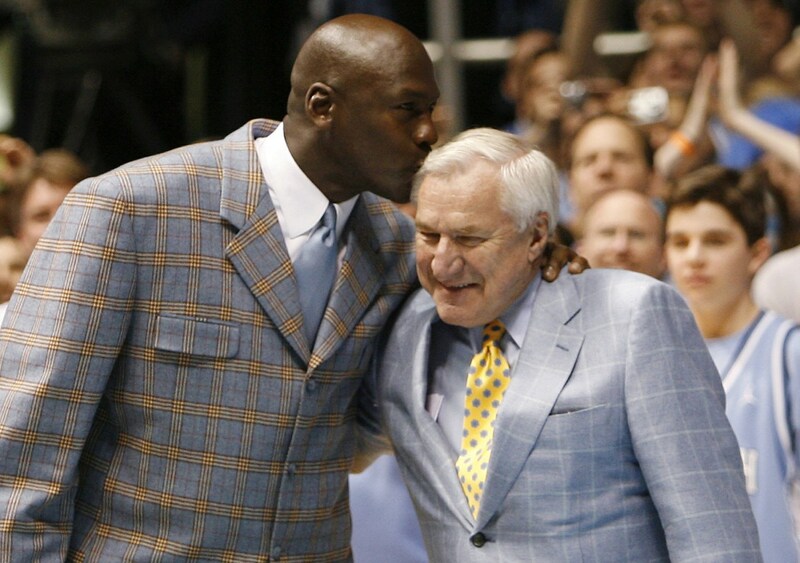 I’m grateful to know more about Dean Smith and his wisdom about just doing the right thing. He was, of course, an anomaly. But those good souls are out there in the sports world, thank goodness.